Soothing Touch Spa at Marigot Beach Club Spa and Wellness Retreat. Add a touch of extra calm and relaxation to your holiday at Marigot Beach Club Spa and Wellness Retreat – we offer a wide range of spa treatments that will help you forget your worries and rediscover your inner tranquility. Soothing Touch Spa offers an excellent selection of treatments, including full body massage, reflexology, facials, wraps and hair braiding – so as well as feeling fantastic, you’ll look your very best throughout your stay. 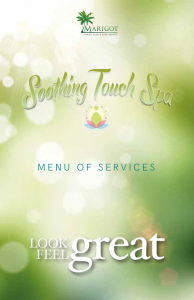 Soothing Touch Spa is open daily from 9Am-5Pm. We recommend that you book your sessions in advance to avoid disappointment – please send us an email with your preferred dates and times and we’ll do the rest. For prices, please see our activities and treatments price list page.